For applications requesting grant funding of more than $25,000, you must provide funds from non-federal sources in an amount that is equal to or greater than the amount of the request. No cost sharing is permitted for applications requesting amounts of $5,000-$25,000. Museums Empowered: Professional Development Opportunities for Museum Staff is a special Museums for America (MFA) initiative with the goal of strengthening the ability of an individual museum to serve its public through professional development activities that cross-cut various departments to generate systemic change within the museum. Institute of Museum and Library Services (IMLS) encourages applicants to invest in the professional development of museum staff, volunteers, and interns to enhance their skills and ensure the highest standards in all aspects of museum operations. Museum Grant Resources, including sample online documents, searchable grant databases, and online workspaces for finding and collaborating with grant partners. 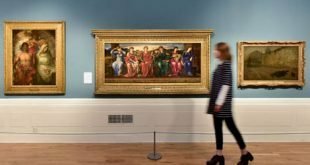 Does anyone know of any similar grants for museum staff ? Thank you !